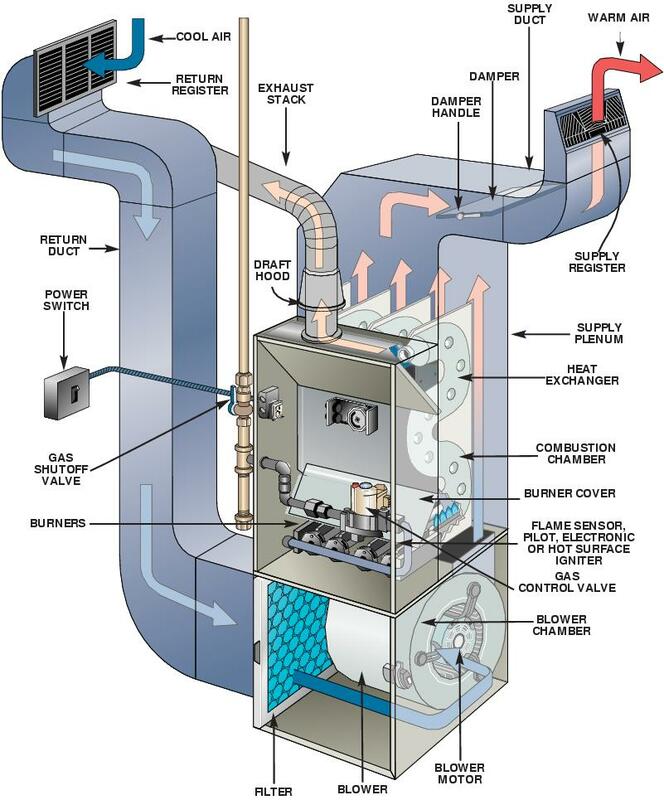 Gas furnaces are the main type of furnace we encounter in Raleigh NC and all of central North Carolina. They are the primary type of heating system used here in the United States. They operate via forced heating. Cool air goes in, the air is heated by direct application of flame, and the warm air comes out. They sound simple enough when they are working, but then they are broken that is when you need someone like us, or someone who services your area to com in and perform a furnace repair. The heating cycle begins with the thermostat. The thermostat knows when temperatures have gone below the current setting. For example, if you have the thermostat set to heat at 68 degrees, when the temperature gets down the 67 or lower, the thermostat triggers the fan which pulls air through the heating chamber. At the same time a valve opens to allow gas to flow into the burners. A pilot flame or spark then ignites the gas which heats up the surrounding air. After the gas flame begins to heat the air, the unit’s blower motor starts and pushes warm air out. As the warm air is pushed out, cold air is sucked in through the return ducts in each room. As seen in the image, the exhaust stack lets fumes out of the home. 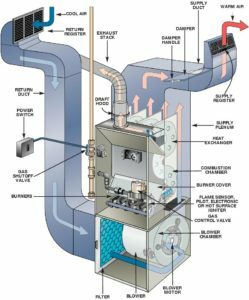 Blower motors, heat exchangers, igniters, etc are all common failures in heating systems and furnaces. If something breaks we are happy to come take a look at it for you. If you have an old unit, it may be time for a new system. We do free estimates on new installs. Of crouse, we always fix what we can and are happy to service all of central North Carolina and Raleigh with heating and furnace repairs. We hope someone finds this article informative and that you do not need us! But, we’re here, and we’re locally owned and operated.